Yes, we LOVE Green Eggs and Ham - and not just because eggs and ham are yummy, but we mean the book you are likely reading to your young children as Dr. Seuss' birthday is celebrated across the country this week. We are big fans of Dr. Seuss. His words are silly and draw our children into the world of all sorts of imaginary creatures, encouraging young and old to bring creativity to life. As literacy teachers, we also like Dr. Seuss books because they help our children develop rhyming skills, the ability to play with words, and are valuable as children learn about Concept of Print. Let's delve into word play as this is an often overlooked school readiness skill. Words in Green Eggs and Ham provide a starting point for adding initial consonants to words like am (called the rime). Children can say and point to the words am, Sam, ham. They can cover up the initial consonants (onsets) in Sam and ham to see the little word (rime) am in these words. Other words like Pam, yam, tam, jam, and ram can be made. * Print these on foldable tagboard so you can have children fold the onset in and out to say the words. See the photo below. 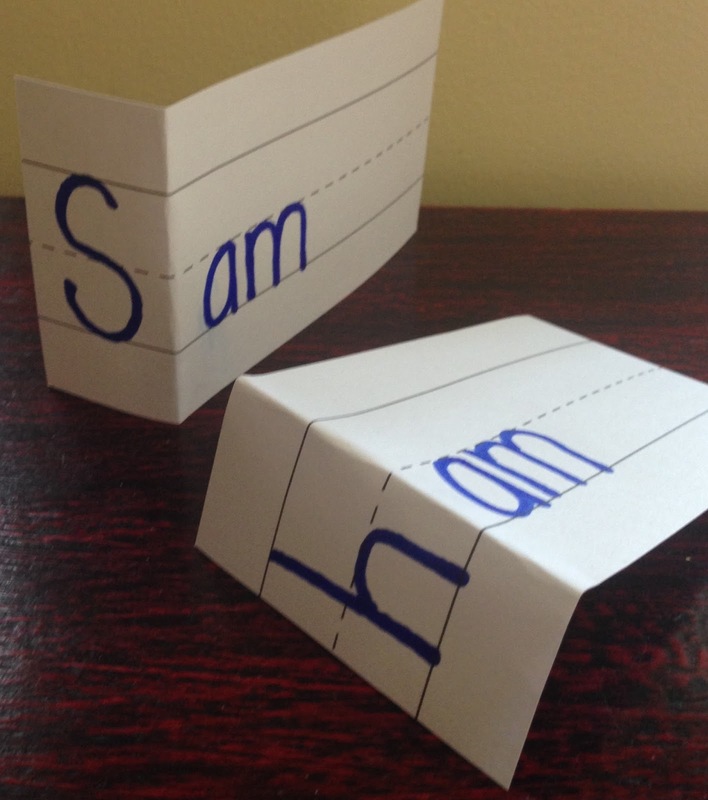 Encourage children to fold these sections back and forth, saying the words, am, Sam and am, ham. Invite young learners to "think like Dr. Seuss" and make up silly words like fam. They can even draw their own cartoons to illustrate the meaning of their new words, in Dr. Seuss style! Of course, the best part of a Dr. Seuss celebration is reading his books with lots of expression. This sets the stage for fluency...and love of reading! *Some children may say, dam, with a sly smile. We suggest simply accepting the word and saying, "Oh yes, beavers can make a dam in a river." Case closed as long as you do not overreact! Kathy was always so good at animating and she does a great job reading this book. So nice to hear her voice again.Brings back memories of being in her class at LSU-E.